We offer a range of machine safety services, scalable to fit the needs of small single site enterprises to multi-site international operations. We provide a consistent approach, incorporating the needs of regional and international legislative compliance and we have the capacity to implement your safety policy globally. Better productivity. 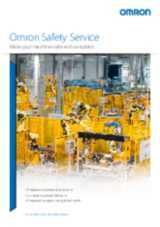 New functional safety standards mean that machines do not always need to be shut down when intervention or access is required, we have the ability to create safe control solutions using the latest safety techniques that sustain the highest possible levels of safety whilst reducing restart delays and potentially saving materials wastage.